Fifteen past six in the evening found farmers in East Tennessee in their milk barns. July 9, 1964 was a typical evening. Thirteen year-old Kenneth Trentham was helping his mother, Mae Edith Trentham, milk cows. He was standing outside the barn, heard a whistling sound and looked up to see the aircraft coming down directly overhead. One second later it seemed to hit the “first tree” and explode. A tremendous fire spread over the hill. Kenneth Trentham's sister-in-law, Lavonda Trentham, is steadfast in her conviction that young Kenneth was the only person to have seen the plane crash in to the hillside. The various newspapers and news agencies quoted others who stated that they saw the plane actually crash but, given the nature of the topography, it is doubtful anyone else did see the crash. More than likely, these people witnessed the flash when the plane exploded. The picture on the right is the back of the barn looking in an approximate direction of 135 degrees, which was the heading on impact that was found on the aircraft's navigational equipment. The aircraft came very close to striking the roof of the barn. On the left of the picture is Trentham Hollow Road. 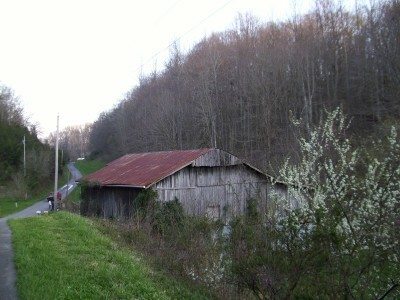 The aircraft crashed on the wooded hillside in the background of the picture-slightly above and to the right of the barn's peak. The hillside is extremely steep if one is to hike directly up from Trentham Hollow Road. The crash site is a few hundred feet directly above a small pond that is alongside the road. The pond was not present in 1964. The area of the pond is where one of the Rolls Royce engines landed following the crash. When I mentioned to Kenneth Trentham's brother, Denver Trentham, that the engine “rolled down the hill”, as I was led to believe after reading some accounts, he corrected me by saying that the engine was “blown” down the hill. The shortest distance to the crash site is straight up the hill from the pond. It is extremely steep. Having attempted, myself, to climb up to the crash site from the pond, and after giving up in a few minutes, it is understandable why a road was bulldozed on another side of the hill where the slope was more gradual. There still appears to be a lack of vegetation along parts of the road that was quickly cut through the thick vegetation in order to enable workers and vehicles to approach closer to the crash site the next day. According to the Civil Aeronautics Board Aircraft Accident Report: “The aircraft struck on a 45-degree, heavily wooded slope at an elevation of approximately 1,400 feet m.s.l. The heading on impact was 135 degrees, the nose was approximately 55 degrees below the horizon, and the bank angle was about 45 degrees left wing down. The wreckage except the No. 9 emergency window and some small pieces from the cabin interior, was contained in an area 300 feet long and 200 feet wide. …The aircraft wreckage was fragmented and severe ground fires burned for several hours after the accident. All major components were accounted for at the accident scene and there was no evidence of pre-impact structural failure…“ Kenneth Trentham's testimony of what he saw that day, along with the C.A.B. Report's description above, should put to rest claims, such as the Associated Press next day headline that stated the “Plane Exploded In Air”. The picture at right is the Trentham home which is situated directly across Trentham Hollow Road from the crash site. Individual accounts from those who were first on the scene paint a horrible picture of the crash site. There were 23 ambulances, some coming from as far away as Cleveland, Tennessee, parked along the road and in Mrs. Trentham's yard. 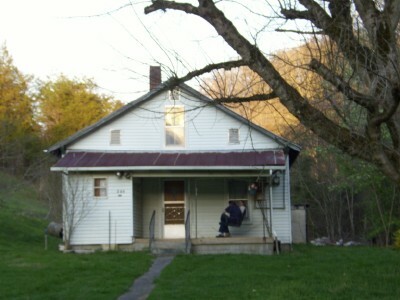 Mrs. Trentham allowed the Newport/Cocke County Rescue Squad and Cocke County Sheriff's Department to use her home as a headquarters. The next day, as the FBI, United Airlines, Vickers Armstrong, The Airline Pilots Association, and British Aircraft Corporation began to do their respective work in the recovery, these entities also used the Trentham home as their headquarters. The year 1964 was many years before the advent of the cell phone and personal computers. Many homes in East Tennessee still had no telephone communications. The Trentham home was fortunate to have a telephone, but it was an 8-party line. The next day, there were two private lines running into the Trentham home, a result of United Airlines footing the bill. Despite the trauma of being in close proximity to the crash and the disruption of their lives, the Trentham family did their best to help those who were tasked with the grim job of the recovery. Whether it was carrying a bucket of drinking water up the hill to thirsty workers or whether it was Mrs. Trentham cooking, the family taught those who had traveled great distances about the hospitality that was intrinsic to living in the South. Mrs. Trentham did not have a lot but the people who, out of necessity, were her guests were welcome to what she had. These important government officials and company executives who had traveled great distances had to have been surprised that Mrs. Trentham had no indoor bathroom. And despite the interruption of great magnitude the crash presented, everyday chores like putting cows out to pasture and milking them twice a day while tending to the crops continued to take place as they always had. The term “flyover country” had not been coined at that time, but those officials and executives who had come from their large, fashionable population centers learned valuable lessons in this tiny spot on the map. One such lesson was that, even though the country folk in Trentham Hollow may not have had very much, they were extremely proud of who they were as people. They had a different way of measuring things, the most prominent of which was the measure of one's character. This is still evident today.